I’ve been a fan of morning yoga for years to wake up and “get the blood flowing.” Who knew it could have such an awesome effect on kids too! A month into the new year, the early excitement of waking up for school has worn off a bit for my oldest daughter. Last year, we started playing music in the morning, which brought an immediate smile to her face. However, at the time, her baby sister slept with her door closed (with a monitor), so she wasn’t disturbed by the music. Now that my youngest is a toddler, she insists on sleeping with her door open and will wake up right away if she hears a peep. She doesn’t want to “miss out” on anything, but the problem is, she is a major grumpy bear if she doesn’t get enough sleep! So this year I found a quiet way to help my oldest daughter wake up happy, while my youngest daughter sleeps soundly: morning yoga. This 5-minute morning yoga routine requires no special equipment: your kids simply roll out of bed and start stretching right in their PJs! I recommend doing this short routine with your child so you can enjoy the benefits as well. These gentle movements awaken the body and mind. We start by standing with feet shoulder-width apart. I tell my daughter to imagine that her feet are glued to the floor — every other part of her body can move freely, but the bottoms of her feet are stuck. With feet firmly planted, we begin the routine by lightly wiggling the rest of our body. We take a few deep breaths and as we let out the air, we allow our bodies to sink down a few inches. We spend about 1-2 minutes on the grounding process, to allow our bodies to gradually come to life after a night of slumber. After we’ve “gotten the wiggles out,” we start our stretching. As we inhale deeply, we slowly bring our arms straight overhead. 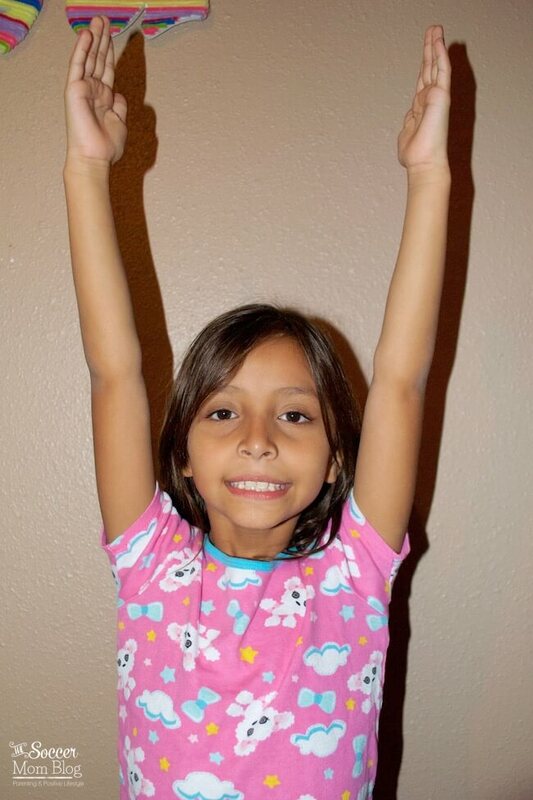 We are big football fans, so I tell my daughter to pretend as if she is signaling “touchdown!” Hold this pose for about 5-10 seconds, stretching as tall as possible while keeping feet solidly on the ground. After a good stretch to lengthen our body, we then do a “swan dive.” Arms sweep to the side as you fold at the waist, keeping your back as straight as possible. At the bottom of the fold, release your back and relax your entire body. Gently swing your arms, shoulders, and head side to side, keeping your lower body in the same place. After about 20-30 seconds of this, we roll our bodies back to standing. 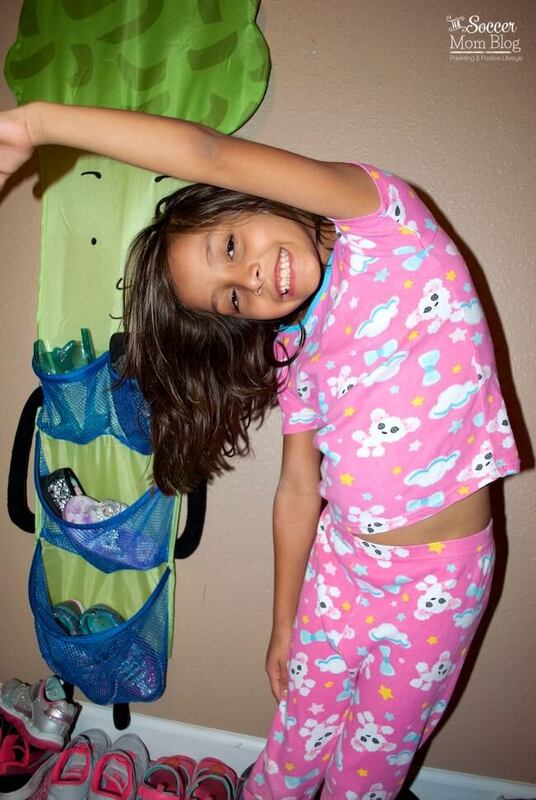 I tell my daughter to pretend she is a worm, and to uncurl her body slowly as she stands, with her neck straightening last. We are now back to a strong, standing position. In our standing position, we raise our arms back overhead to a touchdown pose. We then lower our left arm to our side and curve our body into a bow shape, leaning over the left side. Right arm remains overhead and stretches with the curve. Look up at your right arm. Return to a straight standing position and repeat with the left side. For the last 30 seconds or so, I told my daughter to pretend her arms are noodles. When my husband practices yoga with me, he will sometimes have trouble releasing the tension in his muscles, but my daughter took this direction exceptionally well! Keeping feet firmly grounded, start twisting your body at the waist, so arms swing around from the front of your body to back. Gradually pick up speed, so arms will “slap” your torso as your body’s swing propels them. (This actually should not be a true “slap,” but I wanted to give you an idea of the way your arms should swing freely). Slowly reduce your twisting speed until arms come to rest at your sides and you are again standing still and straight. You’re now ready to face the day with a strength and a smile! Gaiam Yoga Mat — I got this hot pink yoga mat for my daughter and she is always so excited to use it. Gaiam is a respected name in yoga and their products are affordable quality.